Everyone wants a best android Smartphone through that they can access all social Networking sites, email and others important task. 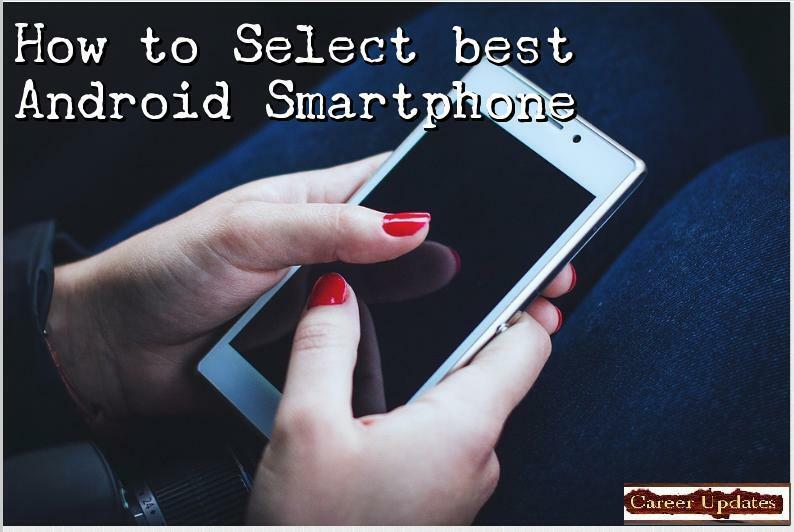 Nowadays we have lots of brands that provide cheap and best Smartphone but you need to know how to select best android Smartphone for your daily uses. Indeed today, with the latest technology more improving, Smartphone are also getting smarter with these latest technologies embedded in them. Different companies in the market are manufacturing latest versions of their mobile phones which are making a big confusion to buyers while selecting a mobile phone. However, because of the reason that these Smartphone are coming so expensive, it is important to go through the complete research for the product before purchasing it so that the deal could be a better deal. There are different specifications in a mobile phone related to its hardware and software. With getting all the information related to its specifications, it is easier for the buyers to look for the best product that they should purchase. There are various ways through which a person can look for the best Smartphone to purchase it. Here are few parameters on which you can look for the best Smartphone. · Display Size: The size of the Smartphone should be that much so that you can watch the graphics into it easily. Generally Smartphone are very smaller in size because of which it is not possible to run videos into it, cannot access internet properly into it and there are many other things that are restricted. If you are taking a phone which is of better 4.5 inches or 5 inches, it would give you the kind of picture quality which you are expecting. With larger display size, you can do easily things on it. These days, Smartphone are coming with High Definition display quality which is considered as the best invention. With other latest technologies, you can expect much more in a Smartphone than others. · RAM and Processor: If you are functioning smoothly on your mobile phone without getting any interruption and problem, then you can rely on its features and functions. One thing which is considered as important is its processor and RAM which should be so strong that it should handle multiple tasks at one time. The latest versions of mobile phones are having dual processors of quad core which is helping them is running multiple tasks at one time. In the same way, RAM determines the memory of the processor so that it can work. Hence, with the high speed processor, an equally capable RAM is important to support multitasking. · Storage capacity: Due to high resolution some games can easily take up more than 1GB memory, high-res of photos, image and videos take more storage, I recommend opting for as much internal storage as possible as well as a good expendable storage in your Smartphone. You can use microSD card to expand your storage up to your need. · Camera Quality: It is a very important application in a Smartphone and this is the reason that most of the companies are providing high definition picture quality so that people can click photos properly. Considering the camera quality of the reputed companies in the world, they are providing maximum pixels to their Smartphone which could really effective to the camera cautious people. With this way, you could not only capture your memories but also you can record them. Flash is an important tool along with camera. · Physical Component: Among every other hardware, battery plays an important and major role because at the end, it is the battery which supports a mobile phone properly. While the Smartphone are available between 1800 and 2000 mAH battery, they function properly when they have a capability upto 2600mAH battery.